Green Medical Group serves patients from all across Washington State. Our patients choose us for our professional quality health care. They put their trust in us, because they know we are giving the most safe, legal and compliant service in Washington State. We are rated the #1 clinic in Washington for providing medical cannabis authorizations. Patients truly change once they come back for follow up visits with our doctor. Our patients also enjoy our 24/7 patient verification service, which is completely automated with an up-time of 99.9%. This means you can confidently get verified everyday of the week, including holidays, or night hours when most clinics or doctors are not running. What does 24/7 verification mean to you? Would you pay a little more for that convenience? All of our patients have – and will not accept any less. Green Medical Group will be sponsoring hepatitis research soon. We are excited and thrilled at the opportunity, and what it can mean for the medical cannabis community at large. More details to come in the future. Please view all of our ongoing projects here. Green Medical Group has completely revolutionized the way for patients in Washington State to be verified. Now faster than ever, patients can be verified in seconds with virtually zero-margin for error. 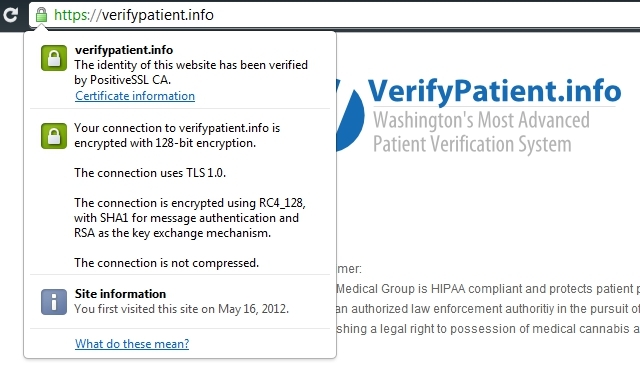 Visit our verification system today at: http://www.verifypatient.info. Our new software technology removes all of the hassle from your doctor, while providing you the ultimate convenience of automated, 24/7 verification. Strict HIPAA Compliant Data Center and 256-bit encryption means confidential patient data is completely protected and secure.